I stopped in the L’Occitane store in the Pittsburgh airport the other day, really to do nothing more than kill time, only to be surprised by a host of new and re-released fragrances. Which was the scent that stole my heart and made the biggest impression? Easy: their newest fragrance for men, Eau des Baux; a blend of cypresswood and incense with hints of cardamom and coumarin. Eau des Baux opens with an ambery blast that immediately reminds me of Nina Ricci Memoire pour Homme and L’Artisan Tea for Two — warm, resinous, almost-smoky, with sweet honeyed tones. Within 15 minutes the scent relaxes and becomes much more subtle and here I’m reminded of Boss by Hugo Boss or Dior’s Bois d’Argent; the drydown exudes the warmth of an aromatic pipe tobacco. This is really the entire story, with the coumarin adding an almost vanillic edge, and the cypress adding a hint of powdery woods. The scent goes on strong and then quickly settles into an ambery second-skin aroma. Thirty minutes on the skin and the scent is in its final and permanent stages. Forty-five minutes in and I find myself thinking that I should add a hint of coffee bean oil to this scent to give it a deeper base. 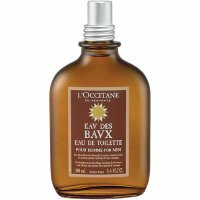 Heck, this one could be easily accented with anything from patchouli to almond and the area of my skin where Baux overlapped L’Occitane Vetyver was even more heavenly! Alas, though I love the scent, I get the distinct feeling that somehow the composition is unfinished, or lacking something. I was surprised that when testing the sample later at home, the overall aroma seemed slightly more subtle than I had imagined, which quite frankly is a good thing considering the potential for “ambery goodness overkill”. The unisex factor is high on this one — I can think of more than a few gal pals who will swoon the first time they sniff this — and the sillage and longevity are both average, which is par for the course with L’Occitane. This is going to be a hit for L’Occitane, I feel it. Though with five other re-releases and current standards, not to mention the tea trio, fleurs collection, lavender and verbena aromas, and of course, fragrances like the recently re-released classic, L’Occitane Amber, there’s a lot of competition. But I immediately liked this and thought that though I would be very unlikely to wear Baux in the summer, this simple yet stunning composition will be perfect for the fall. Eau des Baux is $40 for a 100 ml Eau de Toilette. “A blend of cypresswood and incense with hints of cardamom and coumarin. ” Oh my!! I feel like I've never given L'Occitane perfumes a fair try. Must remedy that soon. Thanks for the review! It sounds promising. This is an exceptional scent that is growing on me every time I test it, and L'Occitane Amber is a surprisingly mellow aroma with almost fruity edges…loving these L'Occitane…and if you haven't tried their vetiver, well, you're in for a real treat! If you like woody incense fragrances, I've just tried the brand new L'Artisan Parfumeur 'Dzongkha' (expected : September 15th in Paris). It is really interesting. Dzongkha is actually the name of Kingdom of Bhutan's language. The scent, created by Bertrand Duchaufour (who already did the great Timbuktu) is a combination of incense, papyrus, leather, tchai (Indian tea with milk), vetiver, spices and a hint of peony/rose for a velvety effect. Orange is the color of the label of this surprising olfactory travel. I'm sure many of you will simply love it. Ambroxan – I hadn't heard of this one – sounds fascinating! Do you know if it's aimed at men or women? Huh, anything that reminds you of both Tea for Two and Boss is pretty much a must-try… I stop in there fairly regularly and I have missed this one, will remedy that! You are only scaring me a little with the “amber” part. Wow, that L'Artisan sounds absolutely droolworthy – thanks for sharing, Ambroxan. L'Occitane has always had excellent service; I've never had a bad experience in a L'Occitane shop – it seems most of the employees are excited about customers enjoying the products and having fun. I loved the velvety cedar that this opens with. Think Serge Lutens Cedre or a less floral version of Feminite du Bois, which I think is a great men's scent too. And your comment about the “too much ambery goodness” is right on. After a half hour, this fragrance devolves on me into a powder bomb with some of the basenotes still peeping through. I detest powder in any and all fragrances, and amber and I are not good friends. Funny you should mention trying to “correct” it by adding another basenote. That's exactly what I did. The top screws off and i added some good sandalwood oil and a bit of perfumer's alcohol to cut the sickly sweetness. It's better, but this one is still cloying in hot weather. I'll see how it does in winter. Excellently masculine fragrance that is not overpowering. I have always been a fan of fragrances from L’Occitaine and Eau de Baux is one of my unique favorites. What the primary blogger refers to as “Ambery” scents is a very well balanced frankincense musk that evokes a sense of Fall and chivalric masculinity. Although it is in fact, initially powerful, it rounds out quickly and nicely and is an excellent scent to blend withe the juniper scents in L’Occitaine’s singature male fragrance or softened with a spritz of lavender. I used to use baby water or honey water to soften the tone of Eau de Baux, but unfortunately it is not longer sold. Furthermore, I should mention that L’Occitaine no longer sells their lavender eau de parfum that pairs nicely with Eau de Baux. The new lavender scent has been down-marketed to increase sales and is also not as pleasant or lasting. A disappointing change.